The word smog first appeared in a 1911 report from from the Smoke Abatement League of Great Britain to describe the combination of sulfur-dioxide-laden smoke and fog that killed 1,000 people in Glasgow and Edinburgh in 1909, though it may have been used as early as 1905. That type of smog definition, which comes from coal-burning plants and is common in rainy industrial centers, is known as industrial smog. The modern world is plagued with a new type of smog. Beginning in the 1940s, people in Los Angeles began to notice a persistent brown haze in the air on hot days that caused watery eyes and respiratory problems. They began referring to the haze as smog, but it had a different composition than industrial smog and formed in a different way. 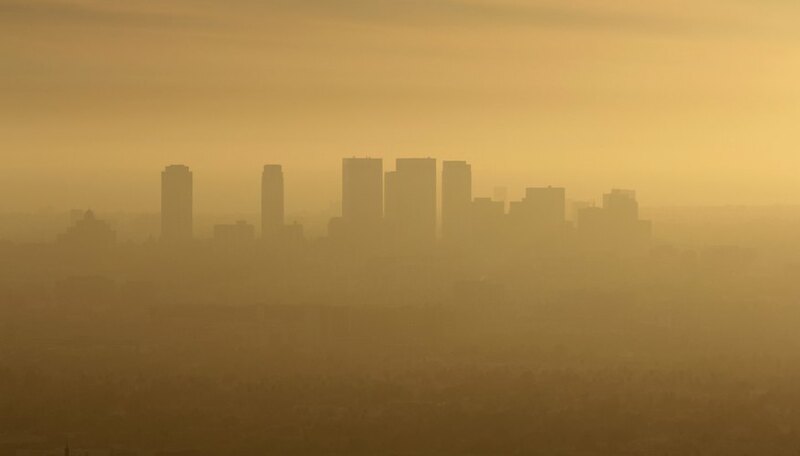 It is officially known as photochemical smog, but even though it affects many cities worldwide, people sometimes call it Los Angeles smog. The unofficial nickname for industrial smog, by the way, is London smog. How Does Photochemical Smog Form? The formation of photochemical smog involves three primary ingredients: nitrogen oxides, hydrocarbons and sunlight. The nitrogen oxides and hydrocarbons are by-products of fossil fuel-burning energy plants, and they can even come from natural processes, but the main source is the internal combustion engines in gasoline-powered automobiles. Sunlight causes the photodissociation of nitrogen and oxygen to yield ozone and oxygen atoms. Oxygen atoms react with water to form hydroxyl radicals (OH). Hydroxyl radicals oxidize hydrocarbons to form hydrocarbon radicals. Hydrocarbons oxidize to form a class of chemicals known as aldehydes. Aldehydes oxidize to form aldehyde peroxides and aldehyde peroxyacids, which are the pollutants that create most of the health problems. What Are the Chemicals in Photochemical Smog? Many major cities maintain a smog index, and one of the main chemical pollutants they monitor is ozone. It's produced as a byproduct of the dissociation of nitrogen compounds early in the process of smog formation, and although much of it gets used up in the formation of other pollutants, a significant amount doesn't. Ozone is corrosive. It causes respiratory ailments, and it damages plants, trees and even paint. Peroxyacetyl nitrate (PAN): This pollutant causes eye and respiratory irritation and is primarily responsible for eye watering during periods of heavy air pollution. Nitrous acid (HNO2): Mildly toxic, this compound also causes respiratory discomfort. Nitric acid (HNO3): A stronger acid and one of the components of acid rain, nitric acid can burn skin and eyes in high concentrations. Nitric acid can also be formed during severe thunderstorms. Because it relies on sunlight to break apart nitrogen oxides, photochemical smog is a daytime phenomenon. This is another feature that distinguishes it from industrial smog, which can form at night or on cloudy days. The worst chemical smog days are hot and still ones, because that is when the sunlight is most intense and there is no wind to dissipate the pollutants. Photochemical smog conditions are worst in warm cities situated in basins surrounded by mountains, such as Los Angeles, Denver, Mexico City and Vancouver, B.C. Many other cities, such as Beijing and New Delhi, are smoggier, but the smog is industrial, not photochemical. Photochemical smog conditions are worst when a city surrounded by mountains experiences an inversion layer, which is a layer of hot air covering a cooler layer and preventing it from circulating. The smog builds up during the day and instead of dissipating at night, remains stagnant. Conditions worsen day by day until until the inversion layer breaks up. Deziel, Chris. "How Is Photochemical Smog Formed?" Sciencing, https://sciencing.com/photochemical-smog-formed-6505511.html. 16 July 2018.